I am so excited to be able to start my TOS CREW year off with this review! Foreign languages have always been important to our family, but never so much as after we adopted our youngest son from Guatemala. Now instead of just being a minor interest, we feel a huge responsibility to make the Spanish language a part of our lives. Easier said than done when you are not bilingual. I knew I should have paid more attention to my high school Spanish teacher. Thank goodness for companies like Classical Academic Press. For the past few years our oldest daughters have used their Spanish for Children with much success and have loved it. You cannot imagine my excitement when I heard they had a new program out intended for younger children. Yes, Classical Academic Press (CAP) has done it again! This program is amazing and I feel so blessed to have been able to review it. 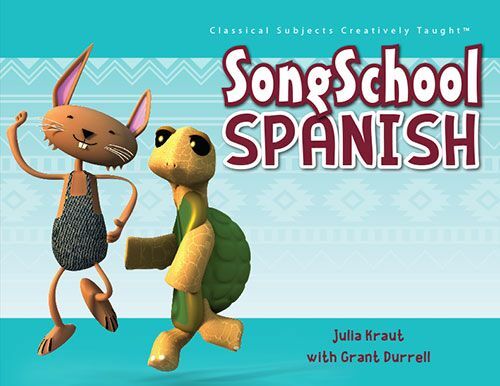 Intended for kindergarten through second grade, Song School Spanish gently introduces young children not only to Spanish vocabulary, but also to basic conversation. Through catchy songs, rhymes, stories and activities the child gets repeated opportunities to learn about five new words a week as well as phrases to use those words in. CAP suggests a three day a week lesson plan, broken into very manageable segments for young children. There are some work pages in the Student Book to write in, along with a few pages of cut outs in the back to be used for the puppet type activities. In addition, the teacher's manual not only has all the answers for the worksheets, but also has extra pages for review, one for each chapter and two for each review section, and an end of the book review. These are great for a child who needs a little extra practice or just really enjoys worksheets. Another resource available is the CAP website you can go to for a fun game as well as free resources. So how did we use this product? My original intent was to use this three days a week, but let's just say that did not happen. Instead we did Spanish five days a week! We have really had fun with this program. On day one I introduced the new vocabulary and listened to the corresponding songs. If you have any trouble with pronunciation, there is an audio file that can be downloaded from CAP to help you out. Bonus! On day two we would review the words, taking turns saying them, sing the songs again, and do the lessons in the book. Because CJ is not writing independently, I would read most sections and he would answer out loud. He was able to do the activities that were matching or drawing a picture with just a little guidance. I would suspect this would be the case for most kids in Kindergarten, though I have no doubt first and second graders could do the work independently. On day three we would again review the vocabulary and songs and do the last section for the lesson, Show What You Know, a great summary of all that you learned. We continued on days four and five singing the songs, using the puppets to make up stories, do the additional activity page in the teacher's guide and did I mention, sing songs? And sing some more? That was, of course, one of our favorite parts...the CD. CJ loves these songs and begs to sing them, even on days we do not do Spanish. I encourage you to hop over to CAP's site and listen to a few. Beware, they are catchy. You WILL wake up some mornings singing them! The words to each song are included in the children's book as they are introduced, but once we learned them, we put the book aside and we danced! Yes, I know the picture is blurry! That is because now every time we put in the CD we dance. And there is just no getting a motion picture with this kiddo that you can see clearly! Because CJ is an active learner, we also used the puppet figures extensively. We used not only the stories in the book, but also made up our own little conversations and plays. They even came out when we sang songs...I figure if we can have fun while we learn, he will stick with it longer. You can probably finish a lesson in about 15 minutes, but we often went 30 or more because of all the things he wanted to add. Singing and dancing, anyone? Our bottom line- We loved this curriculum. I love the blended approach Classical Academic Press takes in teaching a second language. They call it code switching. By combining English and Spanish in one sentence, they slowly introduce a child to the new words without overwhelming them all at once. Using songs and chants on a daily basis further solidifies the new knowledge in a fun, catchy way that makes learning fun, at the same time reaching children with various learning styles. If you are in the market for a Spanish program for your younger kids, this is the one I recommend! The details- We received the student book and CD, which sells for $24.95, as well as the teacher's guide which sells for $24.95 as well. An additional resource that you may wish to buy is the Spanish Amigo Match game or you can purchase the entire bundle which sells for $66.95 Adios Amigos! Disclaimer: I received a free copy of this product through the Schoolhouse Review Crew in exchange for my honest review. I was not required to write a positive review nor was I compensated in any other way. All opinions I have expressed are my own or those of my family. I am disclosing this in accordance with the FTC Regulations. Very cute pics! Stopping by from the crew! Great review. Loved seeing his delight :) in your photos. We've been using another one of their products and I agree they are great. Home four years. Happy Home Day, CJ!